GSQ Blog→French genealogy→A Royal Connection? Ever encountered someone who is certain of royalty in their pedigree? I’ve always given such notions a wide berth, not only because my family doesn’t seem in the least aristocratic but also because such records as exist are widely accessible online, available for replication in other family trees, even if erroneous. Research rigour flies out the window if one accepts that an entry in Geni or Wikipedia connects one’s family to, eg, Charlemagne. Imagine my surprise when I discovered the 15th Century French King Louis XI (1423-1483) in my maternal family tree, through his illegitimate son Fere Frederic d’Mailly. Although the illegitimate children of kings were seldom acknowledged, much less recorded as such, research suggests that Catherine d’Mailly, daughter of a member of the King’s court, bore Louis XI a son – Fere Frederic. My skepticism about claims to royal ancestry remained and I looked for reasons to disbelieve the connection but found instead an interesting phenomenon: ‘pedigree collapse’, which suggests that a royal connection for many of us may be more credible than is supposed, and that we may all be more interrelated than is supposed (the ‘ancestral cone’ theory). Simply put, the standard assumption that the number of direct ancestors doubles every generation – 2 parents, 4 grandparents, 8 great-grandparents, etc – doesn’t work the further back one goes because the the number of direct ancestors eventually exceeds the population of the entire world. ‘Pedigree collapse’ answers this problem by suggesting that the further back one goes, the fewer people were alive at the time; the longer ago an ancestor lived, the more likely s(he) is to have married a close relative (cousin, second cousin), thus reducing the number of ancestors per generation. Because for most of human history generations of a family lived in small communities of extended family and remained in that location their entire lives (I have encountered this pattern in my research), the potential pool of ancestors was further reduced by cousins marrying cousins or second cousins. The point at which the family tree comes closest to the world’s population at the time ‘pinches’ the pyramid. With fewer people in the ancestral pool (because the world population was significantly less), a royal ancestor is not only possible but perhaps likely. Several generations of the d’Mailly line (my maternal ancestry) lived in a community in what is now northern France. There are a number of ‘duplicates’ in the line, among them Catherine d’Mailly, daughter of Comte Adrien d’Mailly and Louisa d’Burgundy, granddaughter of King Joa I of Portugal. The Comte and his family lived in the court of King Louis XI and it is conceivable that his daughter Catherine caught the eye of the King, who took her as his mistress. Catherine also appears in my ancestral line in the family of Adrien d’Mailly (possibly a niece, daughter of Adrien’s brother the Comte?) with a brother Fere Frederic. This may be a deliberate fiction to disguise Fere’s illegitimacy: there is an age difference of 20 years age between Catherine and her ‘brother’, so Fere may well have been Catherine’s son by Louis XI, raised in the d’Mailly family as Catherine’s sibling. 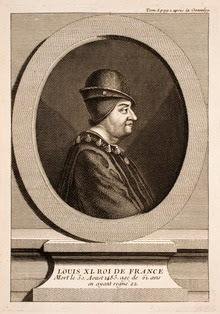 At 13 years of age, Louis XI married for the first time to Margaret Stewart (daughter of James 1 of Scotland) age 11 who died childless four years later. Wife number two was Charlotte of Savoy 8 years old at the time of the nuptials in 1451; the marriage was not consummated for six years but then produced eight children between 1458 and 1472 – alas, not a Fere Frederic amongst them (but an illegitimate son is unlikely to appear in a list of descendants of a King of France, mais oui?). Fere born 1476 would have been the son of Louis’ declining years. Given the correlation between the vital dates of my presumed ancestor and the world population at the time, it appears that a royal connection may not be remarkable. What is remarkable is that I can trace the path back to this 15th Century French King, through the Huguenot exodus from France to Naarden (Holland) and thence to Canada and the United States. Intriguing, but…my aim has always been to write a family history (as distinct from an ancestral tree) that brings my ancestors to life, and a history requires more than vital dates (who begat whom and when). Think I’ll stick to that. the ‘diamond theory’ – royal roots as common as dirt?